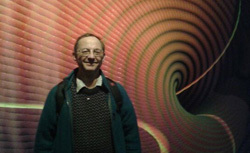 This article is part of our package on the maths of materials, which is based on a talk in Chris Budd's ongoing Gresham College lecture series. You can see a video of the talk below. Perhaps the earliest materials that our ancestors made use of were wood and stone. Wooden tools don't survive for long, but there are examples of stone tools which are believed to be over one million years old. Rock is itself a very interesting material, and its use for tools and then later for building, has shaped human civilisation. Indeed we might say that rock is our longest lasting material. Rock is an amazing material that has shaped human civilisation. When we look at a rock we see something very solid. Indeed this is its main property as a material. However, appearances can be deceiving, and rock has many other properties. Some of these are very obvious to us all. Anyone who has been in an earthquake will have experienced the fact that rock can behave elastically. An elastic medium is one which can be distorted a small amount by a (suitably large) force, with a displacement proportional to the force. Crucially, when the force is removed, an elastic medium returns to its original position. An example of an elastic medium is a wire or a spring. The relationship between the extension of a spring and the force on it was, splendidly, first discovered by a predecessor of mine as Gresham Professor of Geometry: the amazing polymath Robert Hooke (1635-1704). One feature of an elastic material is that it admits elastic waves of expansion and compression. In a spring we can see this by sending a pulse along its length. In just the same way rocks admit waves and we see these in the shock waves associated with earthquakes. As well as being destructive these waves can also be very useful. Indeed much of our knowledge of the Earth's interior comes from studying the way in which these waves are reflected, refracted and diffracted through the rock. By solving an inverse problem (this is a problem in which we try to find the cause of a measured effect) we can then find out the properties of the Earth's core. From a mathematical point of view this involves solving a wave equation. A very similar idea is used by oil companies to prospect for oil. To do this they detonate a small explosion (usually with compressed air) and measure the strength of the reflected waves. This allows them to detect oil deposits deep under the sea bed. The above observations show that over short time scales (which to a rock is anything up to about ten thousand years), a rock will behave elastically. However, over longer timescales rock can behave like a different type of material. We are used to seeing rocks as cold, hard and brittle. However, during the course of their existence, rocks can be hot, under extreme pressure and (over sufficiently long periods) can flow almost like a liquid. This sort of behaviour is called viscous. Unlike an elastic material, in which displacement is proportional to force, a viscous material has a velocity, which is proportional to the applied force. 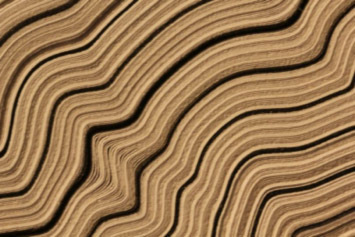 Understanding all of these aspects of a rock as a material allows mathematics to be applied to a fascinating question: how do rock layers buckle under the application of a large force and over long times? The reason this question is important is that under the effects of continental drift, rock layers are subjected to huge pressures from moving plates, and these forces deform the rock layers to produce mountains. 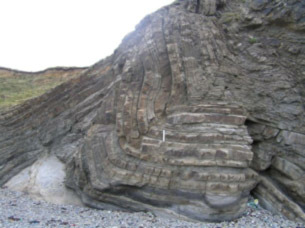 Mathematics can thus be used to predict how rocks fold and how mountains form. 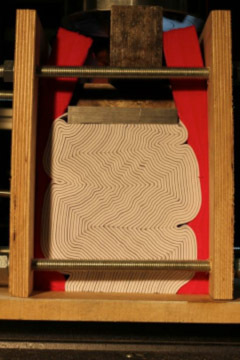 As an example, think of an undeformed layer of rock on which a pressure is acting in the horizontal direction, which we measure using a horizontal -axis. Any deformation will happen in the vertical direction, which we measure using a vertical -axis. Here, is the elastic modulus of the rock, which measures its resistance to being deformed, is something called the second moment of area, and , and are constants which depend on the rock in question. This equation is called the beam equation by structural engineers. It is used to predict how well steel (and other) beams in buildings, bridges and other structures will stand up to buckling forces. Solving it accurately is important in determining safety limits for these structures. The fact the we can also apply it to rocks shows the power and flexibility of applied mathematics. Solving it gives us the shape of the rock layers. An example of a solution is a sine wave, which is the same shape as a wave on a string. 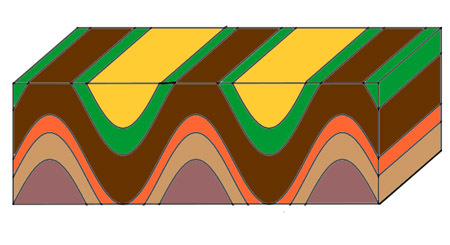 A typical sine shaped deformation is illustrated below. However, not all rocks deform in this way. 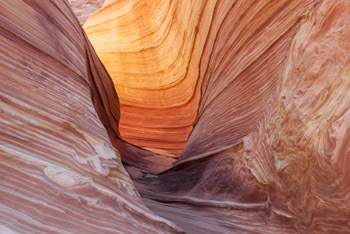 Many sedimentary rocks (which are typically ancient sea beds) form in layers of different materials. We see layered materials in other areas, one example being the composite materials now used to build aircraft wings. When a layered material deforms what matters most is the way that the layers interact with each other, so that one deformed layer lies on top of the next one. Some shapes fit together better than others, and this tells us how the sedimentary layers can deform. Not having any rocks to hand at Bath (nor a convenient continental plate to deform them with) we did a set of experiments with compressing a layered material made up of out of date business cards (a suitable end for these we thought). If you look below, then you can see the results of our efforts. They key thing to see is that we don't get the beautiful sine waves of the text books. Instead we get folds which are straight and have sharp bends. This is a consequence of the geometrical fact that sine waves cannot sit exactly on top of each other: as illustrated by the image above, two sine waves will always be closer to each other at some points than they are at others. Zig-zag shapes, however, do sit on top of each other. So do rocks deform in the same way was paper? Very much so! 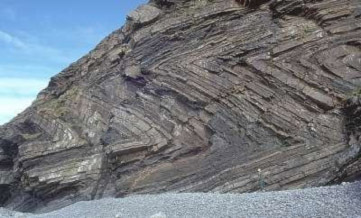 Here are some lovely examples of folded rocks in Cornwall, the top one can be seen in Bude and the bottom one in Millook Haven. These are very well worth a visit. If you look at the paper folding examples you will see that there are occasional gaps, or voids, in the layers. Using the mathematical formulation we can precisely predict where these voids will occur. Why should we care? Voids occur in real rock folding, and it is in the voids that minerals get deposited. One of these minerals is gold. So mathematics can help in a geological treasure hunt. Maybe this might make us all rich! This article is based on a talk in Budd's ongoing Gresham College lecture series. A video of the talk is below.